If love is composed of a single soul in two bodies, as Aristotle, Homer, Montaigne and others have pronounced through the centuries, what does this fusion look like in a horoscope? The aggregate horoscope is a study of two birth charts blended so that the new chart with midpoints of all pairs of planets details the relationship, its mountains and valleys, deserts and lakes. A glance at the aggregate horoscope reveals the soul purpose and the unique taste of this blended dish of love. Properly interpreted, the aggregate chart spells out how each partner feels in the relationship. Who has to stretch out of her own place and who sets the ground vibration for their interaction? 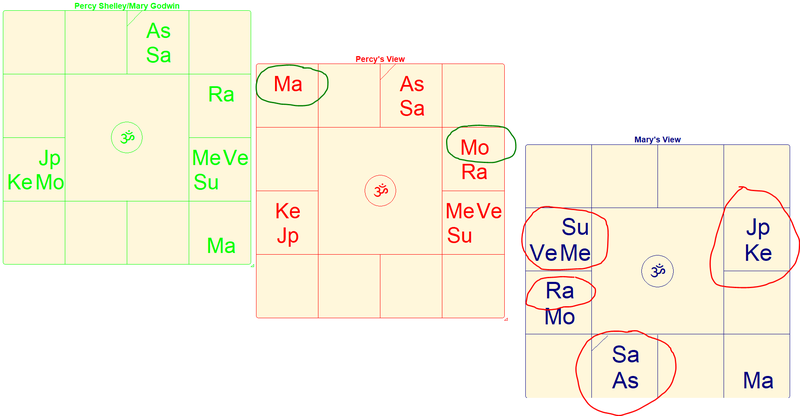 Since there are nine planets in Vedic astrology, there are nine facets of the relationship to consider, while the composite as a whole paints the pleasures and pains for each partner. In each planet pairing, one partner has to reach across the zodiac, while the other holds the home base. In a composite chart where one person is grounded for all nine planets while the other is reaching to the opposite, the balance will be like a see-saw with one end all the way up and one all the way down. These charts apply not only to romantic love, but also to friendships, parents and children, and even relationships of self at one time of life to self at another time of life. From the language of planets’ orbs one can find the meaning of the dance steps bringing individuals together and apart. What about the love story of Mary Godwin Shelley, author of Frankenstein, and the quintessential Romantic poet, Percy Bysshe Shelley? Mary Wollstonecraft Godwin was the daughter of two social reformers. Her feminist mother Mary Wollstonecraft died of fever two weeks after baby Mary’s birth. Mary’s father, William Godwin, was an English progressive known for his book, Political Justice. Mary was brought up in a blended family consisting of Godwin’s second wife Jane, whom Mary detested, and four siblings including two half-sisters, Fanny and Claire, who would figure dramatically in the story. Mary became a strong-minded and intellectually open girl. 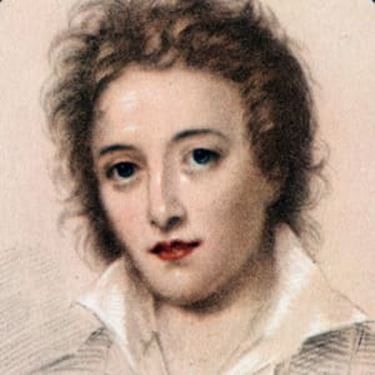 Percy Bysshe Shelley, the aspiring, fiery emerging poet, began to frequent Godwin’s salon in 1813 and found in Godwin a mentor. Each of the sisters was smitten with Percy. But 15-year-old Mary was the one who rose to the surface with her Lagna Lord Mercury linked to the poet’s atma karaka (soul experiencer), the lunar north node also called Rahu. When Percy Shelley met Mary Godwin he already was married to Harriet Westbrook whom he had eloped with when he was 19 and she 16, and they had an infant daughter. Harriet was the first of a string of women to succumb to the future baronet, barechested vegetarian, atheist, college dropout, and sublime poet, in the ancient tradition of Ladies Loving Outlaws. Percy Shelley, already on the rebound from a rebuffed pursuit of his cousin, was stung by Harriet Westbrook’s letters from boarding school threatening to kill herself because of her unhappiness with life, and decided to rescue her by running off with her to Ireland. Harriet actually later did kill herself, but not before giving Percy two children. 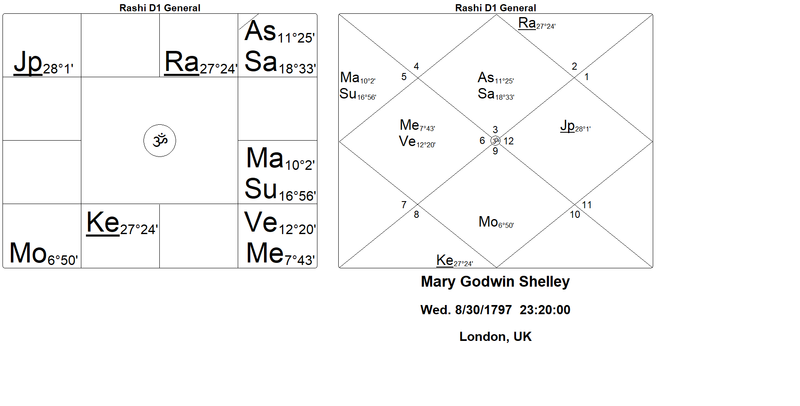 We should expect an unconventional and even sad story seeing that all three charts, both of Mary Godwin and Percy Shelley and of their composite, have Saturn in the Lagna, a place where Saturn can exert maximum pain. The Lagna or ascendant is down to Percy: when we find the midpoint between Aries for Percy Shelley and Gemini for Mary Godwin, the mid-sign is Taurus, and Percy coming first in the zodiac is the driving force. He sets the vibration, she has to stretch across from the opposite sign to find her mirror in the relationship. 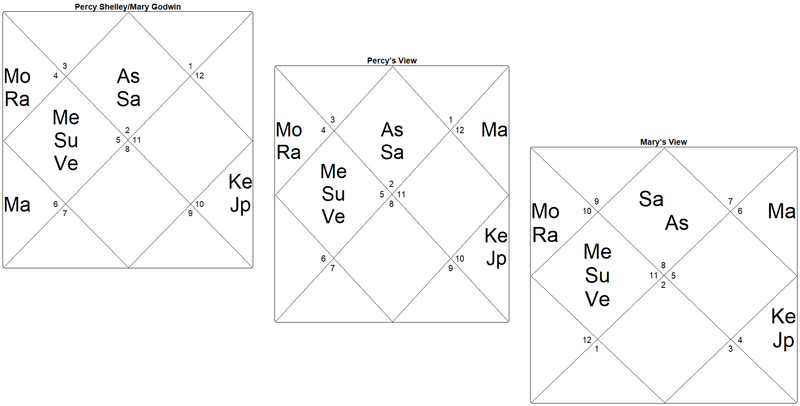 There is a traditional mantra for every pada (3 degree 20 minute arc) of the zodiac, revealing higher meanings. The mantra for the Percy-driven Lagna degree of the couple refers to “Kamapalaya,” who is the protector of Cupid, full of desire’s energy. Percy Shelley was becoming close to William Godwin, Mary’s father, and even promised to pay off debts for the impoverished intellectual. Godwin became almost a father stand-in for Shelley’s own stuffy disapproving father, who had cut Percy off for getting expelled from Oxford over writing a pamphlet on atheism. For Mary this would become a troubling issue, as her infatuation with Percy resulted in estrangement from her father for several years. In the aggregate chart Percy puts the Sun, the father figure, in its own noble sign of Leo, while for Mary the Sun gets banished to its opposite sign Aquarius and brings the cold separation. But Venus in the same house in Leo for Percy has a mantra relating to freedom. Free love was the new catch phrase whispered in progressive circles. 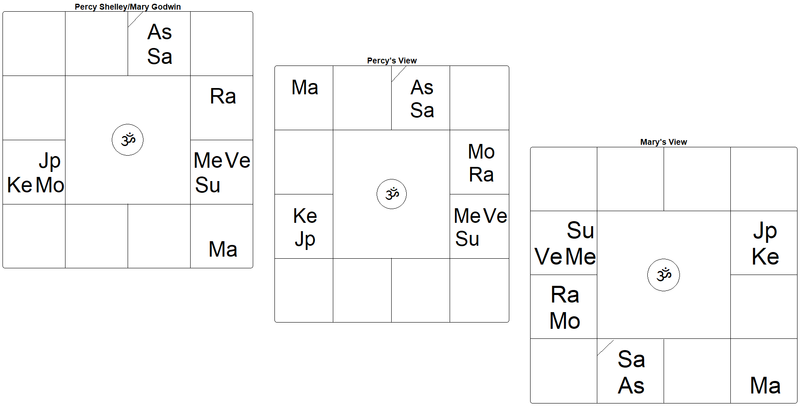 The mantra for the position across the zodiac for Mary’s view has to do with Venus as lord of the place where sugar is produced. Literally a sugar daddy to take her away from the irritating reign of her stepmother. 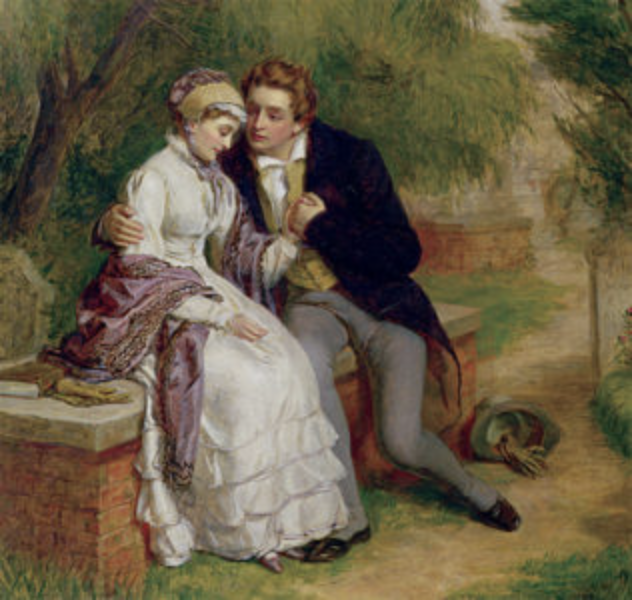 Meeting at Godwin’s gathering on 5 May 1814 after Mary had been away for some months, Percy became newly attracted to Mary’s beauty, her intelligence, boldness and imperious streak, and her evident openness to him. Mary and Percy would walk out to the cemetery where Mary’s mother lay, and here Mary responded to Percy’s urgency. They declared love for each other on June 26, 1814 and almost immediately consummated it. 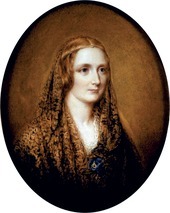 When Godwin found out on 8 July, he at once wrote to Shelley and forbade Mary to see Shelley again. On 18 July 1814, Mary fled with Shelley to France, after Percy also had threatened to commit suicide. Percy was abandoning Harriet and her baby, and various other responsibilities, in keeping with the Saturnian theme of self-evasion with the malefic in the rising signs. Mary Godwin was 16, he 21. At Percy’s urging they brought along Mary’s stepsister Claire “because she knew French.” The runaways toured the Continent mostly on foot, reading to each other and working on manuscripts. On 13 September 1814, the travellers returned to London. Harriet Shelley, by now six months pregnant with Shelley’s second child, sued for custody of her children and for financial support. Percy’s father had cut off his allowance, so Shelley was in dire straits and at times had to hide from creditors. Mary’s half-sister, Fanny Imlay, daughter of Mary’s mother in an out of wedlock romance, also had fallen in love with Percy Shelley. She was kept at a distance by Percy, and also dealing with the turmoil in her father’s household found no out but to end her life two years later. Mary was pregnant when they got back to England, and delivered a daughter who lived only two weeks, and later another daughter and son. Harriet finding out about her husband’s new family resorted to suicide, and her body was found in the Serpentine River in December 1816, just two months after Fanny Imlay ended it all with laudanum. Percy and Mary married less than three weeks after the awful discovery. 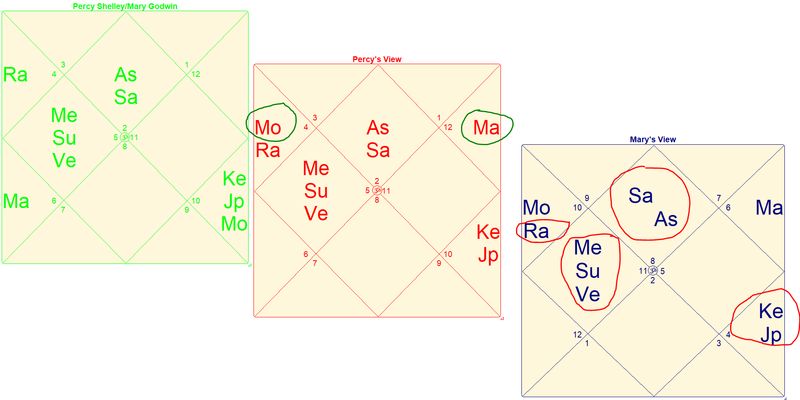 The 4th house of the aggregate chart, showing the Shelley menage, has three planets in too passionate a mixup; besides Sun, the restless and rajasic Mercury is there, the fickle planet, who feels suffocated in too closed-in a set, and Venus, also restlessly aflame. The lunar node Rahu licks the flame with its fiery tongue of an aspect coming from the 12th from Leo into that home abode. The sharpest picture of the fraught soap-opera tension the couple lived in is shown by the nodal axis itself of the composite chart. Shelley has the nearer Moon in Cancer but right with the Dragon’s Head, the lunar node, which Moon has to endlessly battle. Mary then has the stretched Moon in Capricorn right on the Dragon’s Tail, the epitome of extremism, pulling her away from all familiar comforts. Jupiter also is along the nodal axis. 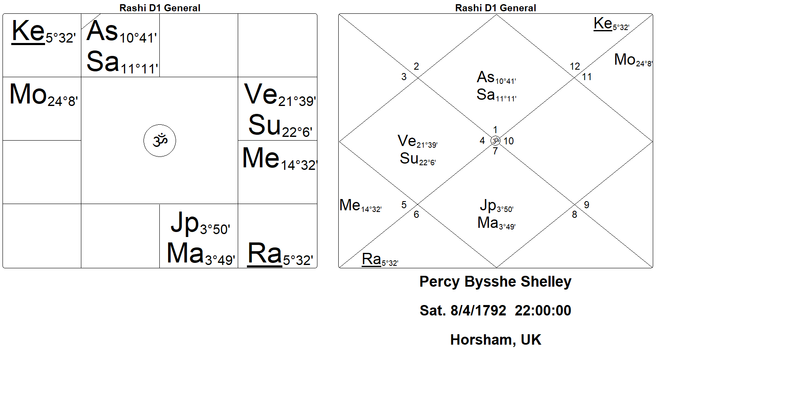 Jupiter for Percy Shelly is debilitated on the south node, the Dragon’s Tail, having all the life taken out of it, and looking with dejected eye at the Saturn on the Lagna. For Mary the stretched (prone to illusion) Jupiter is exalted, promising lasting love, progeny, and freedom, but that this was a stretch was proven by the ensuing tragedies. None of four pregnancies survived beyond a year; only the next to the last, their son Percy Florence, lived to adulthood. 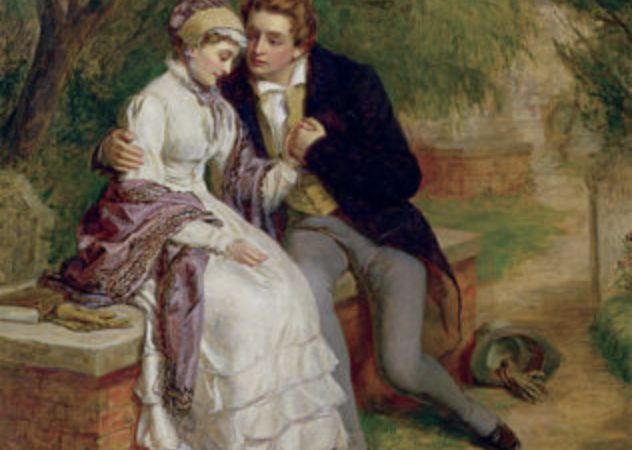 The relations with her husband inevitably grew colder as Mary blamed Percy for cruel insistence on moving the babies around to suit his need to be with his friend Lord Byron, and they caught diseases and died. Percy’s belief in free love as it extended to Mary’s half-sister Claire and likely to an Italian housekeeper also did not live up to the exalted Jupiter Mary reached for. Mary struggled on with depression, writing her own works, partly estranged from Percy who did not stint in looking for inspiration to other women, and sometimes confiding to her journals that she wished for his death. Finally a larger fate overtook the pair, as Shelley drowned in a storm in his 30th year, in 1822 at sea off Livorno in Italy on his sailboat which had been named the Don Juan after his friend Lord Byron’s best-seller.